Hello! 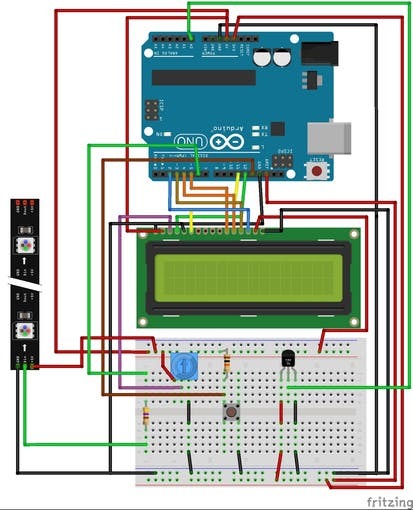 This is a quick, intermediate Arduino project that takes a temperature reading from a TMP36 , reads it onto an LCD screen and gives an “Analog” readout on a Neopixel stick that changes color and number of lights lit every 10 degrees Fahrenheit. It’s easily customizable as NeoPixels can be coded in many ways so the NeoPixel stick can change size and colors every which way a maker would want it to. For this build you will need an Arduino (any one will do, I used Uno), NeoPixels (can be found here) an LCD screen (I used this one) a TMP36 sensor (or comparable, I used this inexpensive one from Adafruit ) a 1k ohm resistor, a 470 ohm resistor, a potentiometer, a simple momentary switch, F to M jumper wires (for the LCD) and M to M Jumpers (for everything else) and a breadboard.